Always 100% chemical-free actives, Sunforgettable® Total Protection™ Body Shield SPF 50 goes beyond SPF to provide all-mineral, totally invisible daily defense from harmful environmental aggressors. A powerful antioxidant that helps prevent skin aging due to pollution and other environmental aggressors. Lipochroman® is a registered trademark of Lipotec, S.A.
Physavie® is a registered trademark of Chemyunion. UVB exposure causes redness or burning, while UVA exposure causes skin darkening/pigmentation. Protection from both UVA and UVB means this product provides Broad Spectrum protection. Total Protection™ Body Shield SPF 50 provides Broad Spectrum SPF 50 (UVB protection) and PA+++ (UVA protection). Total Protection™ Body Shield SPF 50 has a PA+++ rating. We measure our pollution protection by directly measuring free radicals created from UV + pollution events on unprotected skin and skin protected with Sunforgettable® Total Protection™ Body Shield SPF 50. We use a testing technique called electron spin resonance (ESR) that uses a combination of a magnetic field and electron magnetic waves to directly detect the unpaired electrons of free radicals. Is Total Protection™ Body Shield SPF 50 non-comedogenic? Yes, Sunforgettable® Total Protection™ Body Shield SPF 50 is non-comedogenic. Is Total Protection™ Body Shield SPF 50 hypoallergenic? Yes, Sunforgettable® Total Protection™ Body Shield SPF 50 is hypoallergenic and dermatologist-recommended. Is Total Protection™ Body Shield SPF 50 gluten free? Yes, Sunforgettable® Total Protection™ Body Shield SPF 50 is gluten free. People who have gluten allergies may experience sensitivity when using topical products. Total Protection™ Body Shield SPF 50 is gluten free, and therefore, safe for those with Celiac disease. In addition, all Colorescience® products are 100% free from parabens, phthalates, synthetic fragrance, animal testing, talc, dyes, mineral oils, drying alcohols & chemical sunscreen. Is Total Protection™ Body Shield SPF 50 paraben free? Yes, Sunforgettable® Total Protection™ Body Shield SPF 50 has been formulated without parabens. In addition, all Colorescience® products are also 100% free from phthalates, synthetic fragrance, animal testing, talc, dyes, mineral oils, drying alcohols & chemical sunscreen. Is Total Protection™ Body Shield SPF 50 sulfate free? 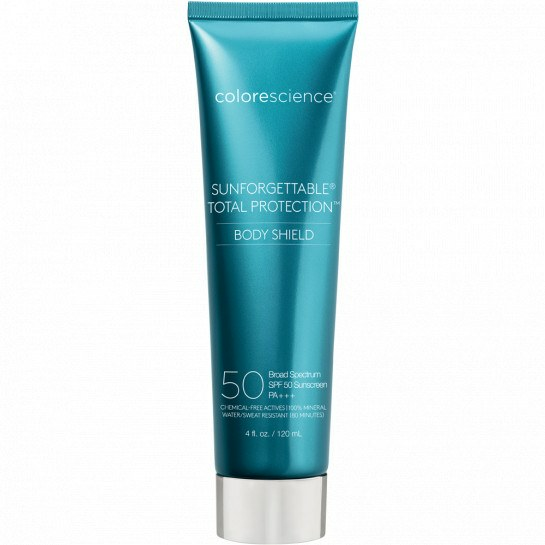 Yes, Sunforgettable® Total Protection™ Body Shield SPF 50 is sulfate free. In addition, all Colorescience® products are 100% free from parabens, phthalates, synthetic fragrance, animal testing, talc, dyes, mineral oils, drying alcohols & chemical sunscreen. Is Total Protection™ Body Shield SPF 50 phthalate free? Yes, Sunforgettable® Total Protection™ Body Shield SPF 50 is phthalate free. In addition, all Colorescience® products are 100% free from parabens, phthalates, synthetic fragrance, animal testing, talc, dyes, mineral oils, drying alcohols & chemical sunscreen. Is Total Protection™ Body Shield SPF 50 oil free? Yes, Sunforgettable® Total Protection™ Body Shield SPF 50 is oil free. In addition, all Colorescience® products are 100% free from parabens, phthalates, synthetic fragrance, animal testing, talc, dyes, mineral oils, drying alcohols & chemical sunscreen. Is Total Protection™ Body Shield SPF 50 vegan? Yes. There are no animal products or derivatives in Sunforgettable® Total Protection™ Body Shield SPF 50. In addition, all Colorescience® products are 100% free from parabens, phthalates, synthetic fragrance, animal testing, talc, dyes, mineral oils, drying alcohols & chemical sunscreen. Apply Sunforgettable® Total Protection™ Body Shield SPF 50 liberally and evenly 15 minutes before exposure to environmental aggressors. Like all SPF products, reapply at least every 2 hours. Can I mix this with body lotion? It is not recommended to mix Sunforgettable® Total Protection™ Body Shield SPF 50 as this causes the formula to be diluted. In addition, Body Shield SPF 50 has rich shea butter esters and a soothing chamomile extract that make this ideal for daily moisturization so mixing with body lotion is unnecessary. Will this rub off on clothes? No, Sunforgettable® Total Protection™ Body Shield SPF 50 blends invisibly into skin and will not transfer onto clothing. How do I wash the product off? Sunforgettable® Total Protection™ Body Shield SPF 50 is water/sweat resistant for 80 minutes but easily comes off with soap and water. Can this be applied on face? While Sunforgettable® Total Protection™ Body Shield SPF 50 can be applied on the face, its texture and weightless finish was designed to be applied on the body. Try our Sunforgettable® Total Protection™ Face Shield SPF 50 which has a hydrating, antioxidant-rich formula with specialty ingredients designed to be applied on face, neck and décolleté. Yes. Sunforgettable® Total Protection™ Body Shield SPF 50 is 100% mineral protection that is free of chemical active ingredients, oil free, hypoallergenic, non-comedogenic and is suitable for all skin types. Do I need to moisturize before? No. Sunforgettable® Total Protection™ Body Shield SPF 50 was formulated with rich shea butter esters and a soothing chamomile extract that make this ideal for daily moisturization. Will this cause me to break out? No. Sunforgettable® Total Protection™ Body Shield SPF 50 is oil free and non-comedogenic (meaning that it is specially formulated to not cause blockage of pores). 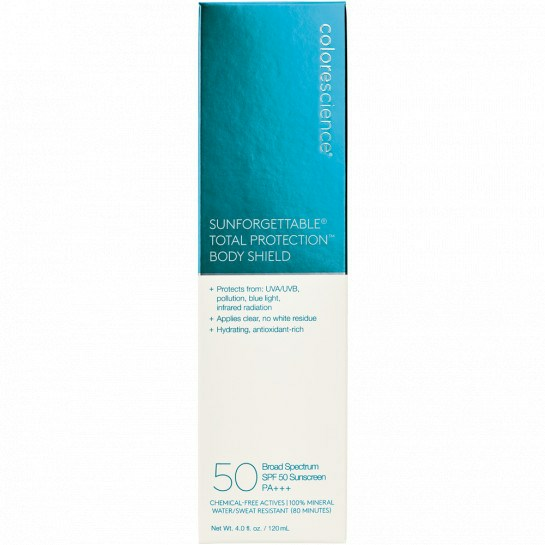 Sunforgettable® Total Protection™ Body Shield SPF 50 has a universal shade due to the coloring of iron oxides. However, when it is applied on the skin, the formula allows for clear application with no white residue unlike other mineral sunscreen care products. Yes, Sunforgettable® Total Protection™ Body Shield SPF 50 has a universal shade that is suitable for all skin tones. It dries clear and leaves no white residue on the skin. 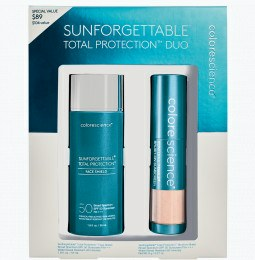 No, unlike other mineral SPF products, Sunforgettable® Total Protection™ Body Shield SPF 50 was formulated with proprietary EnviroScreen™ Technology using patented zinc oxide. 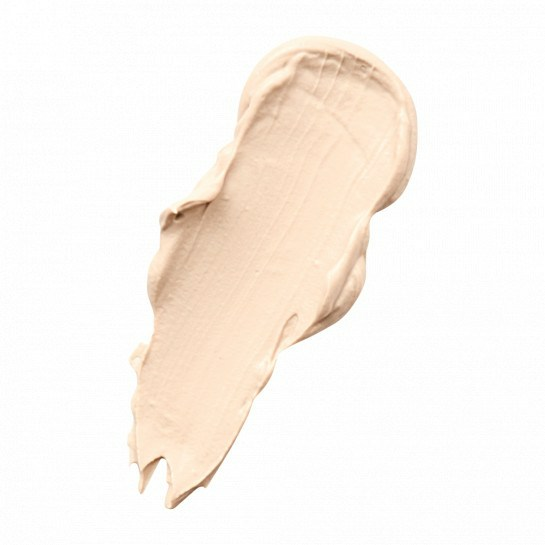 In addition, iron oxides result in a universal shade, leaving no white cast for all skin tones. How long do I have to wait before I go into the sun? As with all SPF products, Sunforgettable® Total Protection™ Body Shield SPF 50 should be applied 15 minutes prior to exposure. Like all SPF products, reapply every 2 hours. Use as much as needed to apply evenly and liberally. A good rule of thumb is to use one ounce of sunscreen for each application. Apply 15 minutes prior to exposure to environmental aggressors and reapply every 2 hours. Sunforgettable® Total Protection™ Body Shield SPF 50 has a 2-year expiration period. After product has been opened, it will last approximately 12 months. See bottom of carton for exact date. As each individuals’ volume and frequency of usage will vary, how long each tube may last will vary. After the product has been opened, it will last approximately 12 months. See bottom of carton for expiration date. Yes, Sunforgettable® Total Protection™ Body Shield SPF 50 is water/sweat resistant for 80 minutes. Shake well before each use. Evenly apply 1 ounce - enough to fill a shot glass, to fully cover body. Apply 15 minutes prior to exposure to environmental stressors and reapply at least every two hours. Destroyed my brand new bathing suit, on its first wear. such a great body sunblock. I recommend to use when in any outdoor situation where you have direct sun or reflective light on your skin. I feel protected when I were this!! Works great! Subtle scented, great protection and doesn’t clog pores! I love the texture of this product and how it’s made with good ingredients. I feel it’s very effective. I don’t love that it tends to gather in my fine lines. However, all I need to do is rub it in again and it disappears. If you don’t mind sorta monitoring that, then it’s a perfect product. Remember to shake well each time! 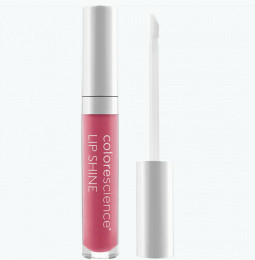 I love products by Colorescience, but this product was not a favorite. It provided me with great coverage but I just wasn't crazy about the texture or smell. My mom got one for me and her, and it has great protection! It lasts all day but also feels light and not greasy or cakey. It is amazing and you can take it with you on the go! Really prevents burning or tanning. The ultimate coverage. Works great. Be sure to rub it in well. I really love this product. I find it easy to apply and I love the moisturizing texture. I have dry skin so it is very good for me. I do find that I have to rub a little more on my neck as there is a little white that shows in the neck lines. I am sure to shake it as the directions on the tube say. I have been hunting for a mineral sunscreen that rubs in well for years and I didn’t think one existed, until I tried this product. It has a creamy, satin like texture and it feels like heaven. It also has a light fresh scent which I enjoy. It feels like pure luxury. I absolutely love this sunscreen! I used Elta MD in the past, but this is so much better for me. The reasons I love it: it is only a physical sunscreen, not chemical; it uses 12% Zinc Oxide; it’s water/sweat resistant for 80 mins. ; it’s got a beautiful tint that dries to a luminous clear so it’s not white & pasty looking; it goes on with a silky feel to it, not thick/sticky or runny and it dries to soft, powdery feel. It’s everything you could want in a sunscreen! I use it everyday on my forearms where I have some Melasma, back of my hands, & chest/neck area. Thank you, Colorescience, for creating this incredible sunscreen for us! I received it for free with a promotion at the time. I like it, but it is expensive. Love the ingredients, but the smell of the product is a bit harsh and it goes on pretty white but does disappear once absorbed into the skin. Overall it’s a good product if I get over the smell, so I mix with a tiny bit of essential oils to help. The ingredient list is absolutely wonderful and better than any body sunscreen out in the market right now, as this protects you from everything! It did not irritate nor clog pores in my very sensitive skin, which is a bonus. I also noticed that after application, my skin did not retain heat nor did it tan when I went out in the sun, which is exactly what I wanted. However... The consistency of this sunscreen is very thick, dry, pasty, which makes it difficult to apply spread evenly. You will definitely never apply more than needed. I was hoping for a more milky formula like every other sunscreen. It also leaves a white/chalky film on my Italian olive/tan skin... Which makes me look ashy, a problem I’ve never had before. Overall, an amazing sunscreen if you’re fair to light medium. I despise sunscreen smell which means I rarely ever wore it, until this one. There is a scent but it fades away and doesn’t bother me, which says a lot because I am extremely scent sensitive. OK so I actually LOVE this stuff. Its really lightweight and has no smell to me. Very moisturizing, I will continue to use this. I bought because of a sale and found a product I love! I WISH this was in a larger size!!! The feel is silky and the coverage is amazing!!! 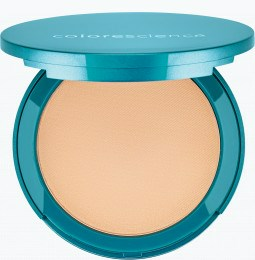 We live at the beach and reapply as needed but this suncreen gets a workout and still protects after numerous slashes. My daughter has sensitive skin and she is able to wear this with no issues!!! Hubby and I used this when doing outdoor work, it worked great! Then took it on a family beach and boating vacation. Reapplying as directed every 2 hours, we were the only two of twelve who did not get a sunburn. A little different then what I have used in the past but good product. 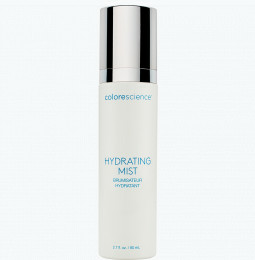 I was so excited to buy this, as most of Colorscience's products are fabulous. However, I will be returning this item, as it has a rancid smell, and it created a white, chalky finish on my fair skin. I will buy more brush-on sunscreen after I return it. Protects your skin from many things other brands do not. Buy it!